The Backstory: Mur Lafferty contacted me several weeks ago asking me to do some guest cover art for her Playing for Keeps PDFs. I was honored that she asked me, and since I had the time to devote to the project, I accepted the task with much excitement. I actually did two covers, this being the first. The Process: I usually start out a piece by sketching the scene out with pencil. If I am doing this piece for someone in particular, I send this sketch to them to make sure our separate visions are jiving. 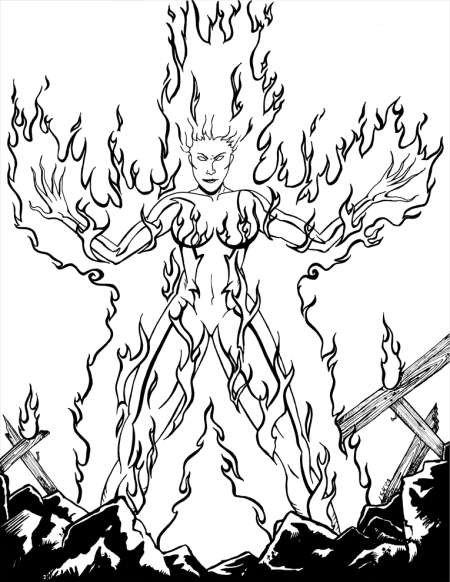 If not, I make corrections to the sketch and resubmit until all is good. After this initial sketch I usually will go over the piece once more with pencil, firming up the lines, sorting out shading, and making the pencil version ready for inking. Since I knew that there was going to be some text added, I roughed in the approximate size of the text to make sure that my art wouldn't conflict. 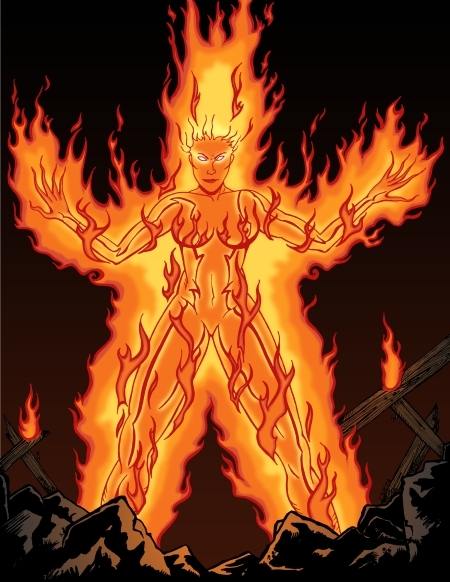 This particular piece was of Dr. Timson (one of the characters from the Playing for Keeps novel) in her fire elemental form. After the pencils are polished up, I ink the piece by hand. I have an assortment of Pitt and Micron black ink pens that I use. The brush tip is by far my favorite as it allows me to easily vary line thickness. On this piece I knew that I wanted to have a black background. I also knew that I was going to change the ink color of the subject in Photoshop. As a result, I didn't ink the background at all. During coloring, the first thing I do is scan the ink version and clean it up. This usually involves a couple of passes with the channel selection tool and tweaking the brightness/contrast of the piece to separate the line art and turn it uniformly black. I then create a new layer and make it a mask for the line art layer. Any coloring I do on this layer will only affect the color of the line art. This is what I did to change the color of the lines on the subject from black to red. I then built up the fire with several passes of the different fire shades, starting with the red and moving to white hot. The rubble at Dr. Timson's feet was colored with a base of gray to which I then applied a radial gradient of orange. The pieces of wood had a base of brown with the same radial gradient as the rubble and additional orange shading was applied. The background was set as black, then a linear gradient of rusty red/brown was applied. Additional Information: If you would like to see the über-sized version of this piece along with the PfK text and issue title added (J.C. Hutchins did a wonderful job integrating the image with the text), you can download it here.